The average angular direction of peak e1 along the left postorbital bar is 53° relative to the A element during left-sided mastication and -44° during chewing on the right (Table 2; Figure 4) (Ravosa et al., 2000a,b). Depending on chewing side, there is a characteristic reversal pattern in the angle of e1 relative to the skull's long axis (±49°), much as predicted by the facial torsion model (Greaves, 1985, 1991, 1995). During left-sided chewing peak e1 is directed anterosupe-riorly, whereas during right-sided mastication peak e1 is oriented posterosupe-riorly. Contrary to the facial torsion model, however, peak principal strains are not oriented orthogonal and parallel to the axis of the postorbital bar. 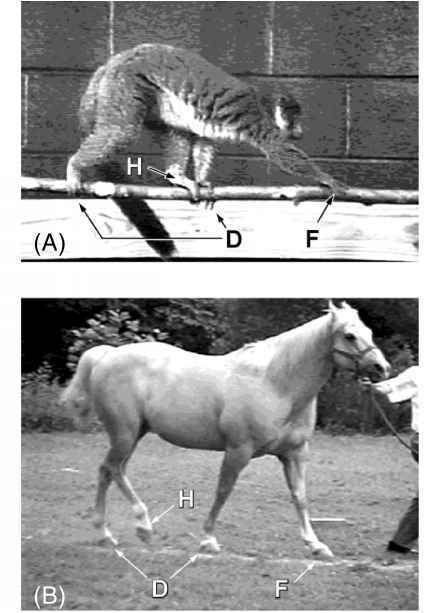 Thus, the primate postorbital bar is not compressed axially on the working side, nor does it experience axial tension on the balancing side (Ravosa et al., 2000a,b). The average angular direction of peak e1 along the dorsal interorbit is -49° relative to the long axis of the skull during powerful left-sided mastication and 63° during chewing and biting on the right (Table 2; Figure 5) (Ravosa et al., 2000a,b). Thus, similar to the postorbital bar, there is a stereotypical reversal or flip-flop in the direction of e1, such that when mastication occurs on the left peak e1 is oriented posterolaterally to the left, while during chewing on the right peak e1 is directed posterolaterally to the right. Assuming symmetry of left- and right-sided loading patterns for a midsagittal structure, such as the interorbital pillar, the mean angle of e1 (±56°) is close to, but somewhat larger than, the 45-degree predictions of the facial torsion model (Greaves, 1985, 1991, 1995). The most probable cause why the direction of e1 at the dorsal interorbit is typically larger than this prediction is that, in addition to facial twisting, the galago interorbit also likely experiences bending in the frontal plane during unilateral mastication. This circumorbital bending regime occurs in anthropoids and is due likely to bilateral masseter contraction and the consequent inferior deflection of the zygomatic arches and, in turn, the postorbital bars (Hylander and Johnson, 1997a; Hylander et al., 1991a,b). ®WS = working-side direction of tension; and BS = balancing-side value. As before, it is unnecessary to note the chewing side for the dorsal interorbital gage.